I finished off this sleeveless version of my Miss Polly design for Juliette over the weekend. It looks great over long sleeves I think and has more of a pinafore feel to it. For this dress, I used some lightweight denim I had in my stash. I actually used the reverse side of the denim as I preferred the colour. 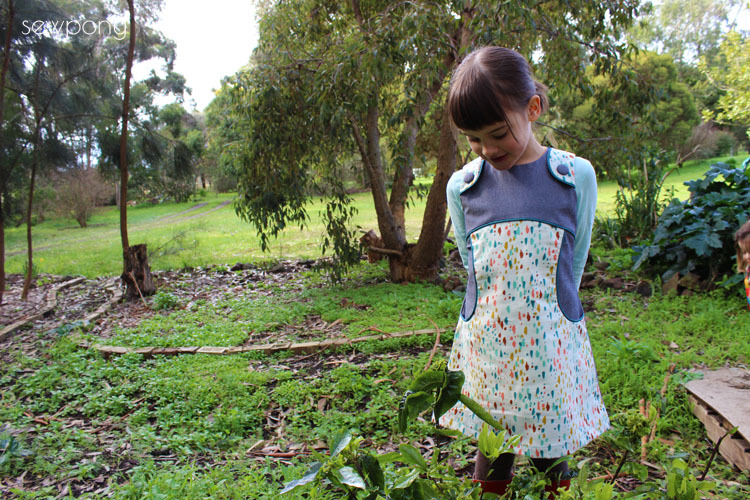 The apron pocket and shoulder flaps are made from some Cotton and Steel fabric August fabric (by Sarah Watts) that I bought from Miss Matatabi. I made some teale coloured piping to match. 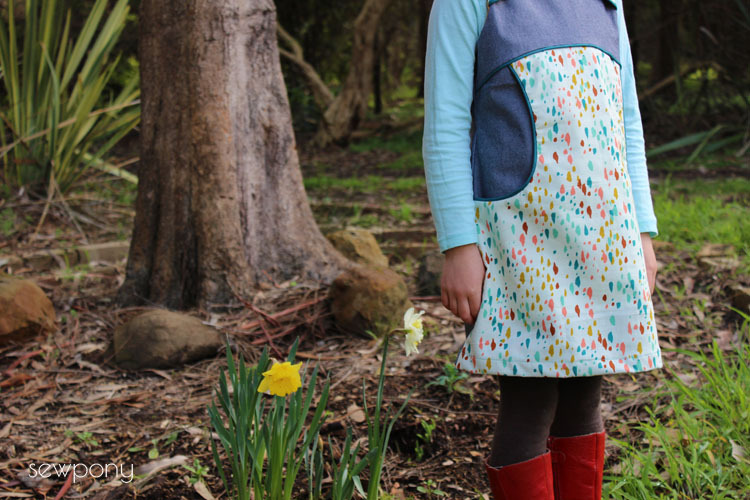 Compared to the first dress I made, this has the contrasting coloured shoulder flaps and plain buttons. Both work well I think. 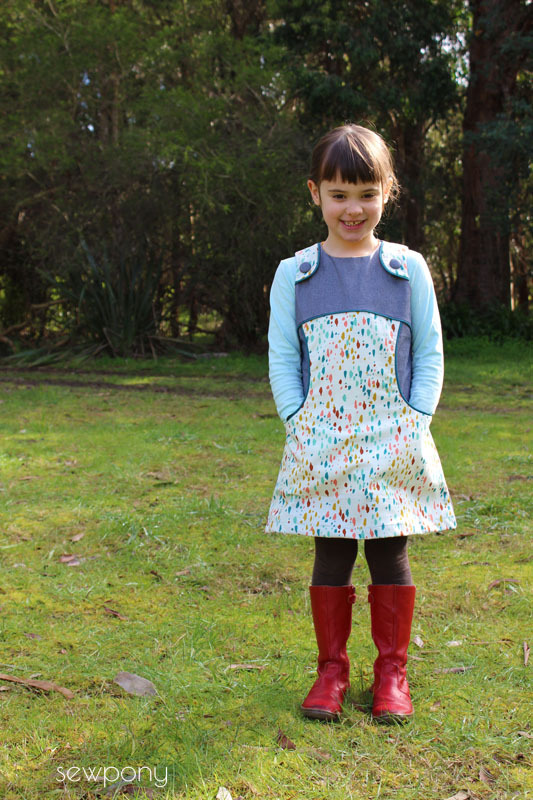 This dress is a great weight for our weather at the moment and Juliette can play freely in it at kinder. As you can probably tell from the photo above, the pocket lining does not extend down to the hem - the pockets would be too deep. 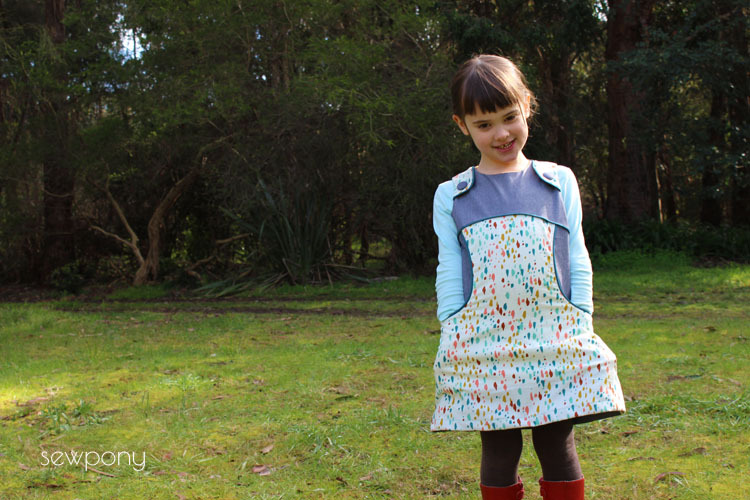 My pattern has been tweaked a bit since this dress - only slightly, and is now ready to be printed again. Just waiting on some lovely fabric to arrive in the mail to begin my tutorial! Wauw, looks great! I'm looking forward for iT! Me too! It is so beautiful! Love this one, Suz! It's so cute over the shirt. Looks so cute! Love it layered like that! that's another great version! I really love miss Polly! It's absolutely gorgeous (as usual)! Looks so comfortable and relaxed. Juliette looks so grown up now too! Wow, this looks like a knock-off off the Tea Party Sundress. Does Oliver + S know about this? I googled the Tea Party dress which is really very cute too but I think Anonymous above is totally off base and frankly quite rude. This dress has a number of significant differences that make it one of a kind and it is just adorable! Great job! Keep up the good work and don't pay any heed to the nay sayers!